Saturday is due to bring a hint of sunshine so grab your coat & scarf and join us and our valiant stallholders in our big blue shed with over 25 stalls of delicious local produce and artisan crafts – we’ll make sure we’re fully stocked with hot food & drinks to keep you warm! 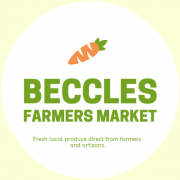 This Saturday 2nd Feb Beccles Farmers Market will be open from 9am – 1pm with a wide range of products all grown or produced within a 30mile radius! We have ample parking including disabled spaces – but sorry no cash machines – hot food & drink available to keep you warm – no dogs, other than guide dogs. P.S. Thanks to everyone who joined us and supported the farmhouse breakfast at the last market and our dedicated customers who support us even in the coldest months.